As you all know by now my love of vintage and stitchery know no bounds. I simply am at my happiest working away in my stitching room or sketching and designing. I love to buy vintage products to use but also enjoy buying tools to apply my trade, and Oh Boy! have I found the most wonderful place in France ... The Maison Sanjou. 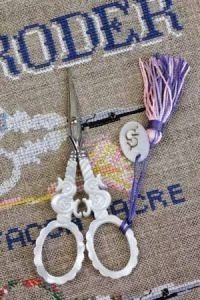 I have just ordered the most amazing pair of embroidery scissors that you can imagine. I love using beautiful things in my work and to apply my trade. I enjoy working with delicate vintage fabrics that honestly sometimes take my breathe away, wondering at my lovely embroidery threads and mother of pearl buttons that I purchase to use in my designs. So it stands to reason when you see an amazing pair of embroidery scissors that I felt and so did my husband, that a purchase was necessary, in fact he has bought them for me. mother of pearl with an S.
is for my name: Sarah. I can not wait for them to arrive. 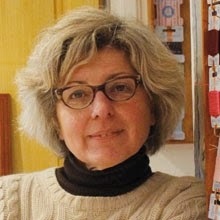 There is a great story to this website and stitchery book which is written by Frederique Crestin-Billet. 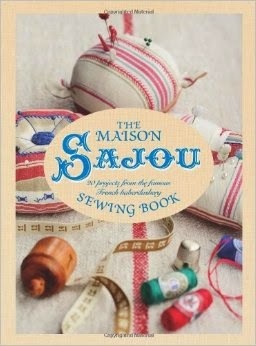 She says that the rebirth of Maison Sajou was the direct result of the long term love of haberdashery and collectables. She has written a lovely book and to be honest with you just to look through it is a wonder, my kind of book. She has opened a website www.sanjou.fr and you can go on there and look at all the wonderful goodies for sale. There is some vintage and other haberdashery based on vintage such as the scissors, thimbles and pins. Her idea was to offer products that were not only made in France, but also originated from their historical regions of manufacture. Textiles, threads from Northern France and ribbons from Saint-Etienne with scissors from Haute-Marne. Not only is there a website but a small showroom in Versailles just next to the palace and this is on my wish list as a long weekend stay. I have been to Versailles before but another visit is on the to do list, especially with haberdashery goodies in walking distance of seeing all those beautiful tapestries and furnishings and the delicate embroidery on show! I hope you have enjoyed the little insight and please check out their website, it is wonderful. Hope you have a great day and Happy Stitching!